Amount of time devoted to this game in the last week--Six hours, 44 minutes. Most recent boss toppled, location reached or milestone achieved--In order: I defeated the Succubus Queen that laid in wait at the bottom of the straightforwardly titled Succubus Field Dungeon, after which I sashayed into Bonfire Town and fulfilled its mayor's inane quests (I put up with them because they netted me the Merchant's License I was so desperately seeking at the time) before moving on to the Underground Farm Dungeon, where I mowed down all of its creepy comers. 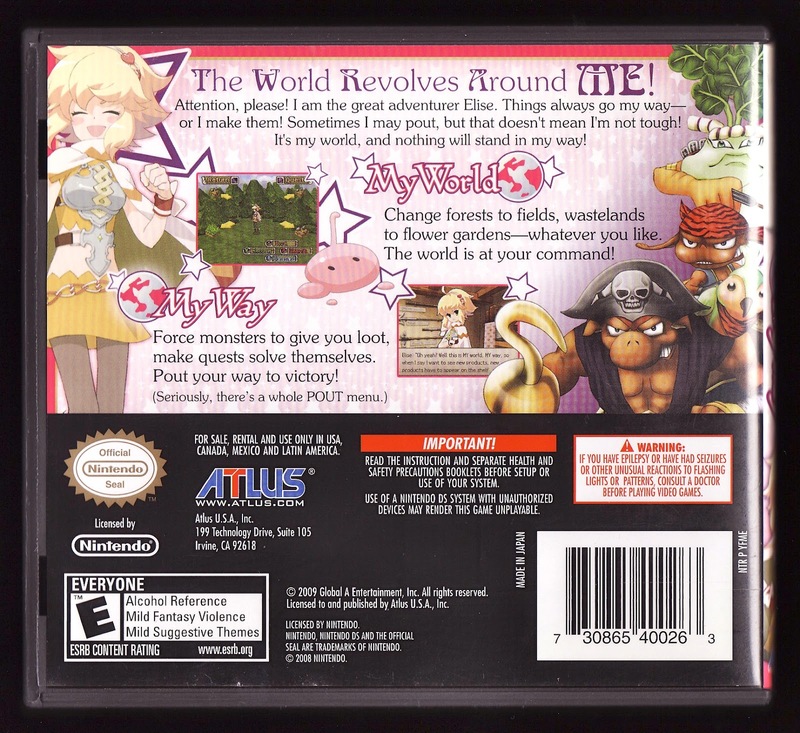 Overall comments on the experience--As I mentioned in my very last post, this Atlus-published DS RPG (it was developed by a company called Global A) shows right from the start that it's going to do things a bit differently by focusing its story on a princess who's basically a spoiled brat. She's also pretty darn stubborn, a character trait that's put on display nearly from the get-go when Elise (the afore-mentioned princess) decides to exchange her beautiful tresses and her comely dresses for the more practical and utilitarian wares of an adventurer--all so she can attract the attention of a mysterious and not easily impressed stud. As you can probably imagine, it's a nice change of pace from the tried-and-true, straight-faced fare that serves as the backbone of your typical Japanese RPG, and it certainly put me in the mood to tackle its pastel-hued adventure. Has it lived up to all of that early-game hype? In many ways, yes, as I've come to absolutely adore its puerile protagonist and its silly story. I'm nearly as fond of the couple of unique contributions it offers to the RPG genre, with the main ones being its much-ballyhooed "pout system"--which allows Elise to alter the landscape that surrounds her as well as attract additional enemies to an area and more--and its weird, board game-esque overworld. That last component is kind of off-putting at first, I have to admit, but after a while it feels something akin to refreshing. 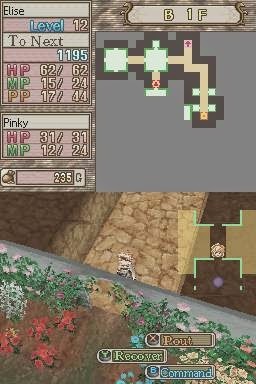 After all, if you're anything like me, shuffling back and forth across an RPG's seemingly endless map screen is thrilling at first but quickly loses its luster, and this alternative--every area is made up of anywhere from 12 to maybe 30 squares, and players can traverse each one in a single step--is a lot more streamlined. Aside from all of the above, the only other aspects of My World, My Way that are worth mentioning are its battles, which are decidedly mundane but not altogether boring thanks to their zippy nature, and its soundtrack, which is banal to the point of being completely forgettable. Will I continue to play this game in the coming days, weeks and maybe even months?--Absolutely. Actually, I plan to complete it--assuming it doesn't overstay its welcome by taking up more than, say, 20 or 25 hours of my time. Do I recommend it to others?--Yes, but not without a few reservations or words of warning. After all, as thoroughly as I've enjoyed playing My World, My Way so far, I still get the distinct impression that many gamers will be bored silly by it. Yes, the writing often is silly (in a good way), and the much-touted "pout system" is unquestionably unique, the remaining components of this portable RPG are far less riveting. In fact, some are sure to find its graphics to be downright ugly and its Dragon Quest-esque battles to be snooze-worthy. Both of these aspects ended up growing on me mightily over the course of my multi-hour playthrough, though, so maybe the same will be true for other folks (especially those with fairly open minds), too? 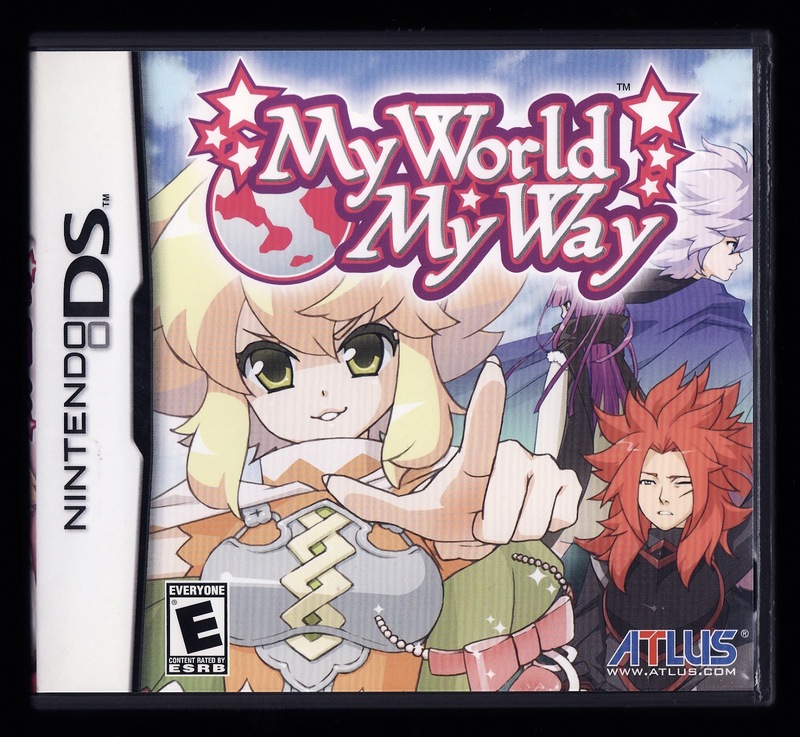 Next up--Nothing, as I'd really like to play My World, My Way for one more week before moving on to another DS game. Beautiful. I'd love to try this one out at some point, if the time is right. I think you'd probably like it, Justin--although it's possible you'd find it a bit too repetitive in the end? As for the repetitiveness, to try and put this in a similar way....hmm. Bravely Default, I had no problem at all with that endgame. I actually liked watching all the new details, even if small. Is it at that level or way beyond it? that doesn't sound to horrible. Glad I could make you aware of this game, Loli! Hopefully you have as much fun with it as I've had so far ^^ As for "Long Live the Queen," I've heard of it but have yet to play it. Sounds like it would be my cup of tea, though. Thanks for reminding me of it!